The ultimate guide to Pozza di Fassa ski holidays. A quiet and peaceful village set in the heart of the Dolomites, this stunning spot is ideal for a leisurely week on the snow. Soak up La Dolce Vita with relaxing evenings in Pozza’s thermal baths and feast on Italy’s famously good cuisine- there’s no better way to wind down after a long day of exploring the sensational Fassa Valley. The village of Pozza di Fassa and the smaller Pera Hamlet are nestled within the stunning surroundings of the Cima Undici and Cima Dodici mountain range, with breathtaking views of the striking Vajolet Towers. Getting here takes about 2.5 hours from Venice and Verona airports and if you’re planning to take the train, Bolanzo and Trento are the nearest stations and have bus and taxi links to the resort. As a ski destination, this small, picturesque village offers snow-lovers a laid-back atmosphere on and off the piste, perfect for a relaxing family getaway. Groups of all abilities will love cruising the piste and stopping off for lunch in one of many charming mountain huts whilst couples can enjoy quality time in the midst of the romantic Dolomites. Free from crowds, Pozza has maintained its lovable alpine charm whilst kitted out with everything you need for a holiday on the slopes. The thermal baths at Central Termi Dolomiti offer a wonderful way to wind down in the evening – the natural sulphurous waters make Pozza unique in the region. There’s a charming Italian vibe in the village itself with quaint architecture and a number of traditional Italian restaurants serving delicious local cuisine. The Buffuare ski area sits above the village has 25km of fantastic skiing to explore before heading out further afield in the beautiful Val di Fassa and magnificent Sella Massif. On the Val di Fassa/ Carezza ski pass you’re able to explore areas including Col Rodella, Belvedere and Carezza and you can ski straight over to Alba di Canazei from Buffaure. The Dolomiti Superski pass is also available and this gives you access to the rest of the resorts around the Sella Massif- you’ll need to purchase this if you’re looking to ski the infamous Sella Ronda ski tour. View our detailed Pozza di Fassa snow forecast or snow report and see all live webcams, piste maps, road and travel maps and lift pass prices. For a picture of historic snow conditions see the snow depths month by month with our Pozza di Fassa snow history. The Vajolet ski school holds lessons on the quiet Fraine nursery slope at resort height, there’s a class dedicated to children and a fun playground on the snow. Beginners can ski the beginner runs of Fraine-Pozza di Fassa which are accessed by drag lifts. With the majority of pistes graded red, this is a perfect destination for intermediates. After rekindling your confidence at Buffaure, you have over 1200km of piste to explore within the stunning Dolomite ski region. The Val di Fassa/ Carezza ski pass gives access to the quieter resorts within the Val di Fassa. Arabba has some of the steepest descents whilst Alta Badia has a number of nice gentle runs. Pozza itself has the longest run in the valley – the Panoramica (well named – the views through the woodland and of the Maerins Towers are amazing) descends from 2050m at Rifugio Baita Cuz back to the gondola station. The two red Valvacin runs also offer an exciting downhill ride- these can be accessed by the Col di Valvacin chair lift. The Sella Ronda ski tour is a must for confident skiers visiting the area- upgrade to the Dolomiti Superski pass to explore this stunning route. Its best to set off before 10 am for this 6 hour round trip, just ski down in to Alba di Canazei and get the ski bus to the starting point at Canazei. For experts, the black Aloch run, which in the past has held the ski training and European cup competitions, is perfect for gaining some speed - night skiing is also held here three times a week. Head over to Sas Pordoi to find some exciting off piste. There’s a self-timer race run at Campitello for competitive skiers and the snow park at Canazei is worth a visit - kitted out with jumps and rails for all abilities. As one of the smaller resorts in the Val di Fassa there’s a laid-back après scene here with evening activities focussed around hotel accommodation and cosy bars and restaurants. Indulge your taste buds at La Regolina - this friendly restaurant offers some of the best local cuisine and La Soldanella is another top spot for traditional Italian meals. There are a number of casual eateries around- Pizzeria Winkler is our favourite with arguably the best pizza in the area. The El Zirm wine bar has a cosy ambience with classic decor and a huge selection of mouth-watering local wines- a lovely place for a quiet evening of sophistication. A number of the hotels have on-site bars so you don’t have to leave your accommodation to enjoy a well-deserved evening tipple, especially convenient if travelling with young children. The sulphorous waters below Pozza give it the highlight of the Centro Terme Dolomiti. These thermal baths make the perfect place to wind down in the evening after a long day on your legs and makes Pozza one of the best places for a relaxing week away. There’s night skiing three times a week at Aloch ski stadium right in the centre of the village. This 1.6km floodlit descent offers a thrilling ride and a not to be missed experience of the snow. Snowshoe excursions and sleigh rides can also be booked through the ski school. When is the best time to ski Pozza di Fassa? Previous years have seen wonderful conditions throughout the season. You’ll usually find the winter period, from December through till March, has the best snow, with the later end of the season seeing doses of lovely Italian sunshine. Italy can sometimes have less snowfall than other European resorts but snowmaking technology means decent coverage. On sunny spring days skiers should catch the first lift to make the most of snow on the higher slopes before kicking back at a sunny balcony for a drink in the afternoon rays. The resort is usually busiest during the Christmas week but remains free from crowds. February half term isn’t too busy as whilst the Val di Fassa is popular with British families, Italians don’t have a half-term so there’s no influx of locals getting their snow fix. As it’s such a great base for skiing the Sella Ronda, the Buffuare area is rarely busy as skiers and boarders tend to disperse across the mountain. Families will appreciate the easy-going atmosphere in this peaceful town. In terms of accommodation, Hotel Sas Morin is a favourite for a family getaway, it has a warm and friendly vibe and is in an ideal central location. The traditional architecture gives it an extra touch of fairytale charm as well as bundles of character which the whole family will appreciate. Another fantastic property is the Hotel San Nicolo, its unbeatable location, just a minute to the Buffaure gondola and a short stroll to a number of traditional restaurants, is ideal for families travelling with children- get the whole bunch straight out in the morning and step back in to your cosy retreat after a long day on the snow. Half-board holidays are really convenient for families, with breakfast and dinner included it’s a hassle-free week and children are usually well catered for with a special menu. If you’re a family skiing with first-timers, the Vajoleta ski school offers a brilliant introduction to the snow for children. They’ll find their feet on the quiet blue Fraine slope at the resort; this wide trail is perfect for conquering the snow-plough. The Bimbo park neve is another highlight for youngsters, with fun activities and equipment on the slope they’re likely to fall in love with the snow straight away. The slopes above the village on Buffaure are fantastic for family days of cruising, the 6km ‘Panoramic’ run starts with a gentle descent turning in to a fun red alongside incredible views. The area is best suited to families of confident skiers as most of the slopes are intermediate level. You’ll find more uncrowded piste at Alta Badia and Canazei and all of these can be skied with the Val di Fassa Carezza pass. For a cheap and easy booking, group your accommodation with flights and transfers or if you prefer to take the wheels, ask our experts about self-drive options. 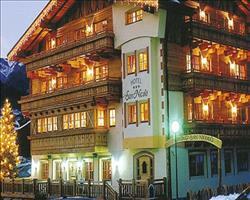 Groups wanting to spend some quality time together on a leisurely getaway will love a week on the piste here. 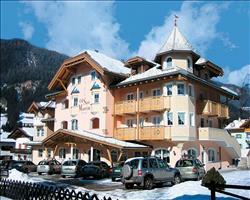 The Hotel San Nicolo is a chalet style accommodation with fantastic facilities and a warm, friendly atmosphere. Groups wanting to be in prime location for the slopes and après scene will love it here - just a minute walk to Buffaure cable car and a number of delicious restaurants and cosy bars. Hotel Sas Morin is good for larger groups, it has 25 comfortable rooms and its classic decor in traditional style gives it heaps of mountain charm. The hotels are in prime location for exploring the entire Sella Massif - ski down into Alba di Canazei and get the bus to the starting point of the Sella Ronda ski circuit at Canazei. This legendary round-trip is a must do for every confident skier and it makes a fun day out on the slopes with the group. You’ll need to upgrade to the Dolomiti Superski pass for this and its best to set off before 10 am so you can squeeze in a good amount of pit stops at the mountain huts scattered around the circuit. For a causal day of cruising, the slopes on Buffaure lend themselves to a leisurely day on the piste. The red Panoramica descends from above 2000m back in to the village, passing some stunning scenery- make sure you have cameras at the ready for some amazing group snaps. Back at the resort there’s loads to do- head for a special meal at La Soldanella, enjoy a quiet drink at El Zirm wine bar - our favourite for trying local wines or just relax in one of the hotel bars.